Thinking about a visit to Secrets Huatulco Resort and Spa for your next vacation in Mexico? Trying to decide whether it’s worth it to upgrade to a swim-out room? Wondering about things to do on this fantastic stretch of Pacific coastline? We’ve got the answers for you. If you’re planning a beach getaway and trying to decide between Secrets in Huatulco or a Secrets Resort in Cancun or Riviera Maya, one of the first things to consider is the weather. Huatulco is located on Mexico’s southern Pacific Coast and receives more sunshine and warmer weather than the Riviera Maya. 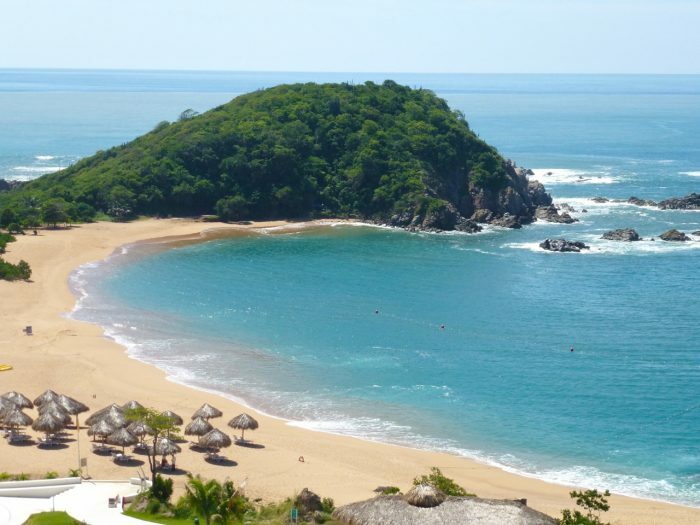 Huatulco’s temperature doesn’t vary much throughout the year and you can expect consistently hot weather and sunshine. Read more about the weather in Huatulco in our Essential Guide to Huatulco Mexico. 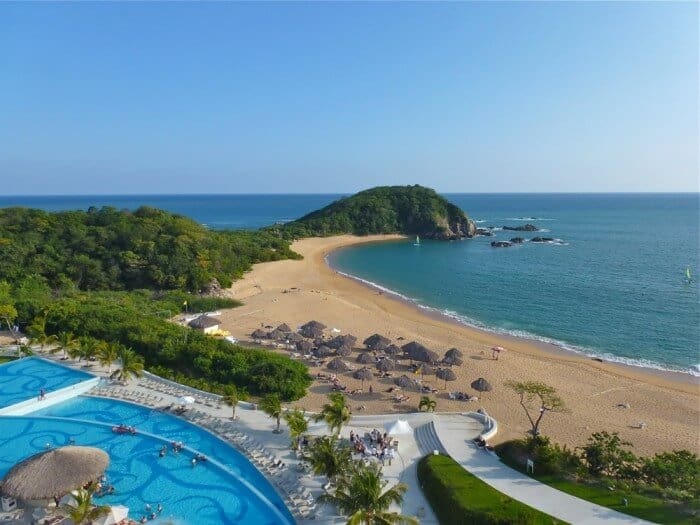 The longest beach with hotel accommodation in Huatulco is Tangolunda Bay where Dreams Resort and the Barcelo (both are family-friendly unlike Secrets which is adults-only) are located. Secrets Huatulco is located on Conejos Bay, a small crescent shaped beach that is quite private ( although not completely private — all beaches in Mexico are public) and beautiful. It has a steep slope so is not the most walkable beach. The waters can also be rough but area calmest near the edge of the bay where the water sports kiosk is located. At low tide, you can cross by foot into a neighbouring bay where there is calm water for snorkeling. 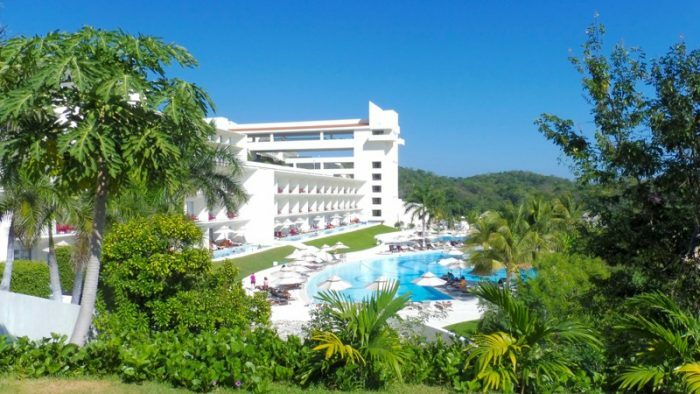 Secrets Huatulco Preferred Club: Is It Worth It? 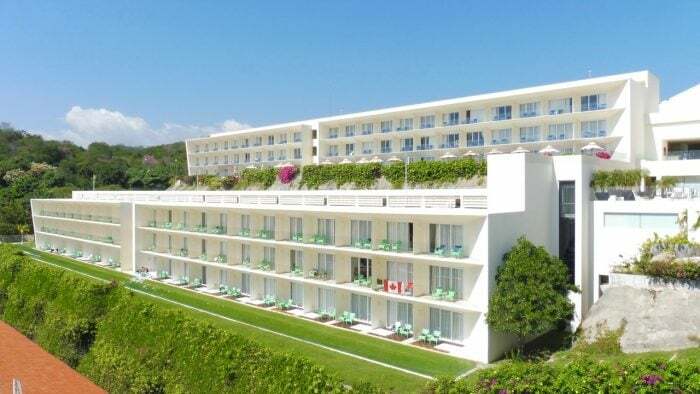 The architecture of Secrets Huatulco features 399 suites in six buildings terraced on a hill rising from the beach at Conejos Bay. This means that while every guest room has a great view, the higher up you go, the better the view. Each of the suites includes a balcony as well as my personal favourite — the Secrets Box for private 24-hour room service delivery. upgraded bath toiletries such as sunscreen, body lotion etc. Preferred Club guests also enjoy private check-in and check-out within the Preferred Club lounge. This is an important benefit if you happen to be arriving the same time as a large group or a charter flight. Beyond that, I’ve never used the Preferred Club lounge at Secrets Huatulco as there are so many other beautiful bars, lounges and restaurants to choose from. Secrets Huatulco Preferred Club suites may also be selected for their terrace whirlpool or swim-out rooms. Click here to check prices for Preferred Club suites at Secrets Huatulco Resort & Spa, on Hotelscombined.com a free search engine that compares prices on Booking.com, Expedia and other hotel booking sites to find you the lowest rate and save time searching. When choosing whether to pay extra for a swim-out suite at Secrets Huatulco, it’s important to consider the climate. While the sizzling hot weather is ideal for a beach vacation, the swim-out rooms at Secrets Huatulco have limited shade which means the terraces get sweltering hot at midday. However in the evening and early morning, they are quite spectacular. If privacy is important to you, you need to consider that you are sharing the pool with other guests and they are ground level which means you give up some of the ocean views available at the higher levels. If you’re travelling with another couple or in a group, booking neighbouring swim-out suites is a fun option. For the quietest suites, opt for a swim-out room in Building 5 which is to the east of the Sky Bar. 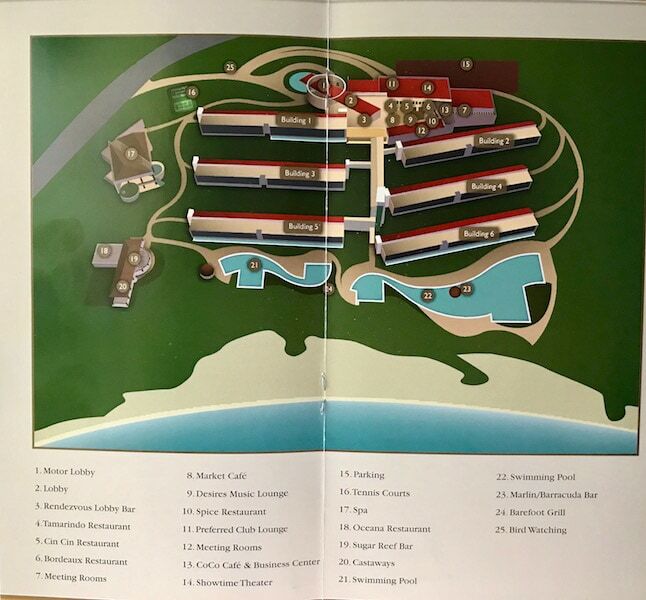 The quietest swimming pool area is shown at #21 on the left hand side of the above map and is pictured below. The liveliest zone of the resort is the pool area shown at #22 on the Secrets Huatulco map as it’s where the Swim-Up bar and pool aerobics are located. 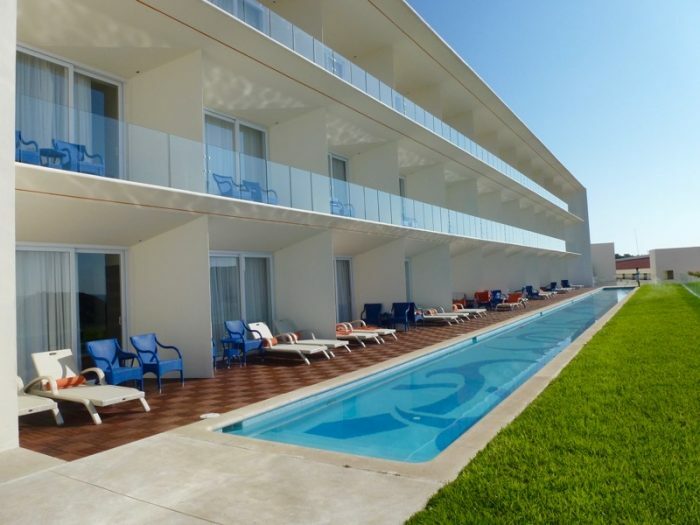 It also offers access to the beach which are at a lower elevation than the pool area. This is the toughest section of the resort to find loungers. The cuisine of Oaxaca is deservedly famous for its diversity, complexity of flavours, the craftsmanship of its preparation and unique ingredients such as chapulines (toasted spicy grasshoppers), mezcal, nopal and moles. You can read more about Oaxaca’s unique cuisine in our post on Must-Try Food and Drink in Oaxaca. At Secrets Huatulco you can select from nine restaurants, including seven with gourmet à la carte menus, one international buffet and a cafe plus there’s 24-hour room service with the Secret Box where your food will be dropped into a pass-through so you’re not disturbed. 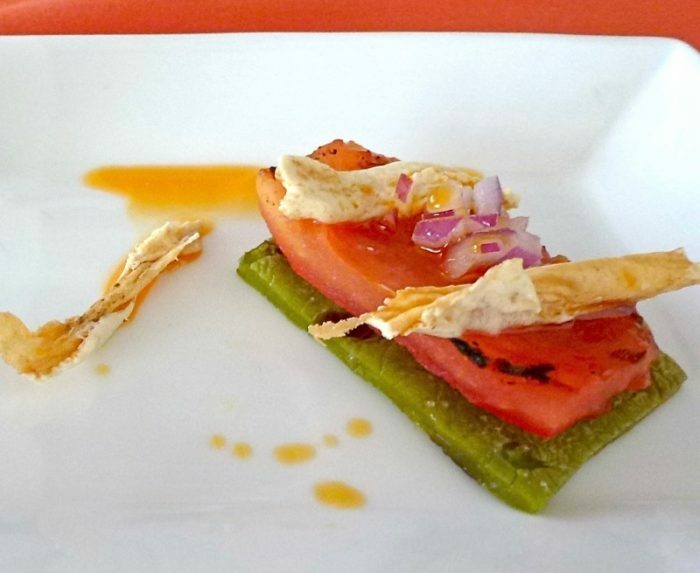 The Secrets Huatulco menu offers many opportunities to sample Oaxacan fare, especially within its Tamarindo Mexican restaurant. However I’ve also discovered that you’ll often taste dishes from other parts of Mexico that are authentically and deliciously prepared. Much like other all-inclusive resorts, not every restaurant is open every day. So it’s worth planning ahead to decide where you want to eat. Equally importantly, the fact that no-reservations are ever needed at any Secrets Resort means you can always opt to dine at a restaurant with no dress code, such as the World Cafe buffet or within your room. 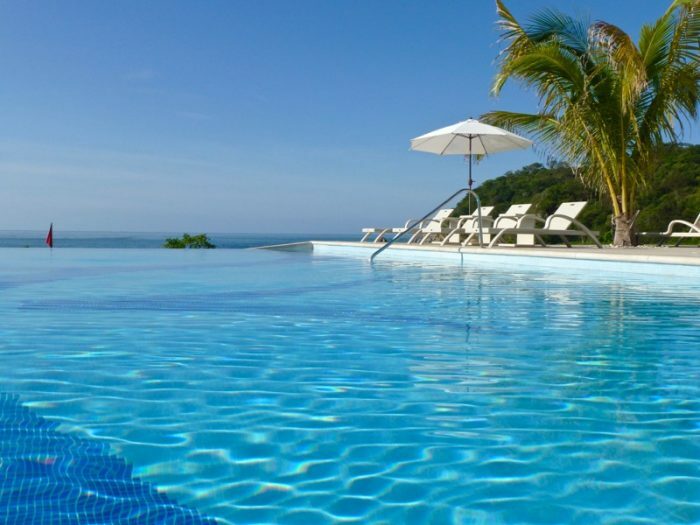 Click here to check prices on the Secrets Huatulco Resort & Spa on Hotelscombined.com, a search engine that compares room rates on hotel booking sites such as Expedia and Booking.com to find you the lowest rate. Much like other upscale resorts in Huatulco ( such as the Barcelo Resort & Spa) there is a dress code at Secrets Huatulco at dinnertime at certain restaurants. Men are required to wear long pants and shirts with collars and sleeves. Women it’s a bit more flexible as dresses are interpreted more loosely. The Secrets Huatulco brochure specifies “dress shoes” for both men and women which generally means “close-toed” but can be safely interpreted to mean no ratty looking running shoes or flip flops. Thankfully, the dress code is enforced so you’re not going to see people in bathing suits dining inside the fancy dining spots such as Bordeaux, the French restaurant. 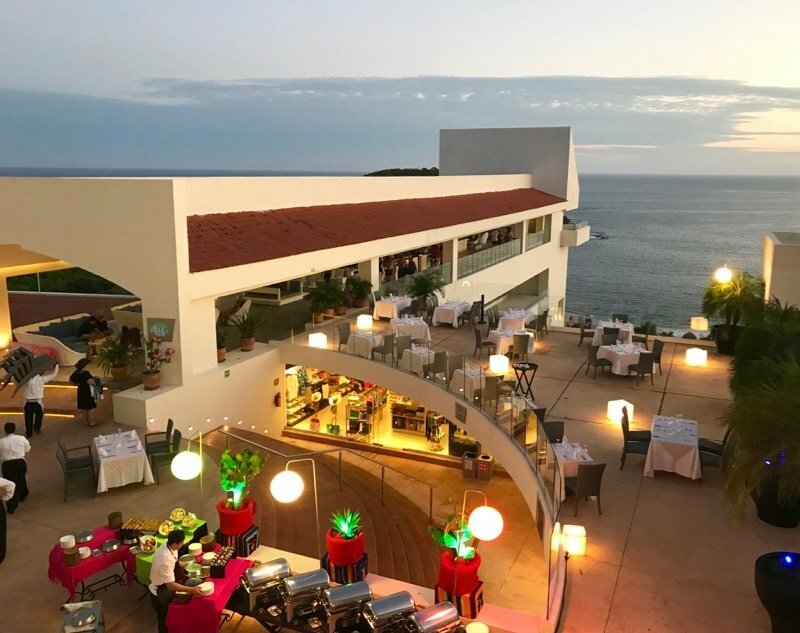 At Secrets Huatulco, I noticed that the hostess would often find them a seat on the outdoor terrace rather than turn them away as I’ve witnessed at other resorts. To avoid disappointment, it’s wise to pack resort wear (check our post on men’s summer fashion essentials for some stylish suggestions). From visiting coffee plantations to touring Huatulco’s beautiful seven bays, there are so many tempting options for things to do during a stay at Secrets Huatulco, it can be hard to decide which ones to choose. Never fear. We’ve done the research for you and sifted out the too-expensive and the disappointing to come up with the absolutely worth-it excursions to invest your vacation dollars in. Whether you’re staying at Secrets or Dreams or the Barcelo, each of these Huatulco excursions includes hotel pick-up and drop-off. That’s especially important if you’re staying at Secrets. 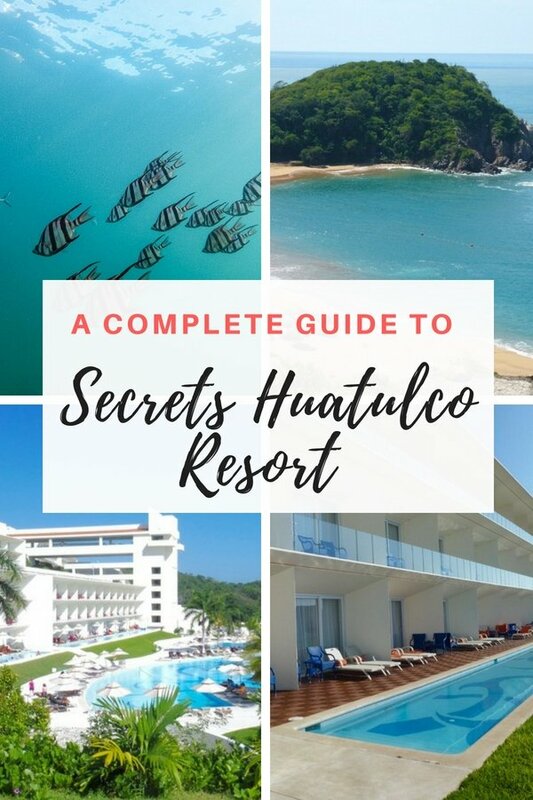 Unlike other resorts in Huatulco that are closer to La Crucecita or Santa Cruz marina, Secrets Huatulco is located at the very outer edges of the string of hotels dotted along the Bahias de Huatulco. This means you can’t just walk to the marina and book a sightseeing tour of the seven bays or visit Puerto Escondido by bus for a few days. The good news is that Secrets partners with Amstar DMC for transfers and destination experiences so this means there is an Amstar desk conveniently located within the Secrets Huatulco lobby where you can browse brochures and register for tours. You do have other options beyond Amstar though. While it’s not recommended to book tours from vendors on the beach, there are several local excursions and accredited tours that are safe, high quality and well worth booking independently. No trip to Huatulco is complete without getting on the water and exploring the seven bays and 36 beaches of this stunning coastline. 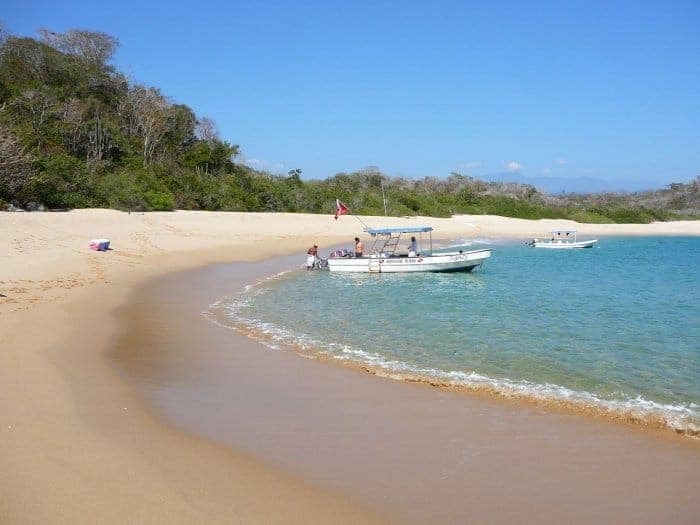 Many of the golden sand beaches are accessible only by water so seeing them by boat is one of the top things to do in Huatulco. For safety and comfort, it’s important to book a tour on a quality boat. While it’s certainly possible to charter a boat independently in Santa Cruz marina or join a group of tourists on a large party boat, it’s important to consider that a luxury water craft offers shade and superior comfort. Both Amstar and Viator offer superior quality tours. 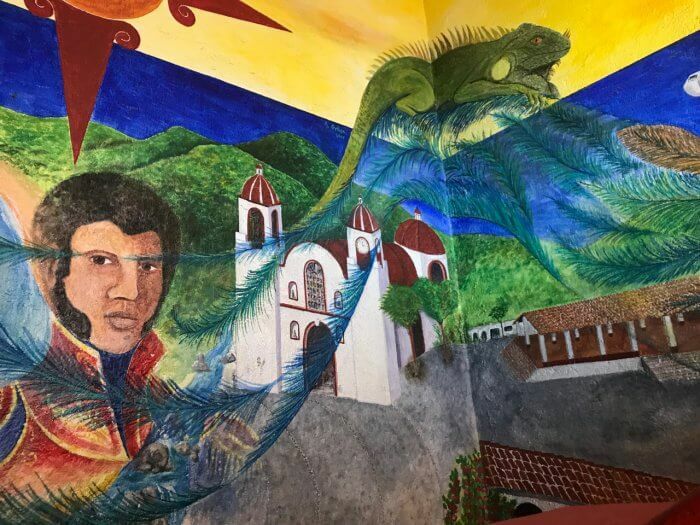 A great option for this tour is Homie Tours owned by Alberto Espana Chavez, a government-certified guide who works in collaboration with other certified guides. Tomas Vicente Contreras led the Three Levels Tour featuring Pluma Hidalgo coffee country I participated in earlier this year. He is very knowledgable and speaks fluent Spanish, English, Zapotec and several other languages. This is not a trip to do independently. Whether you’re interested in Huatulco snorkeling from shore or on a boat excursion to one of its hidden bays, exploring the Pacific Coasts’s extraordinary underwater sea life is one of the top things to do during a stay at Secrets Huatulco. Much of this coastline of Mexico is protected from development which helps support rich marine life and healthy reefs. You can expect to see sea turtles, parrotfish, needle fish, grouper, snapper, angelfish as well as manta rays and more. 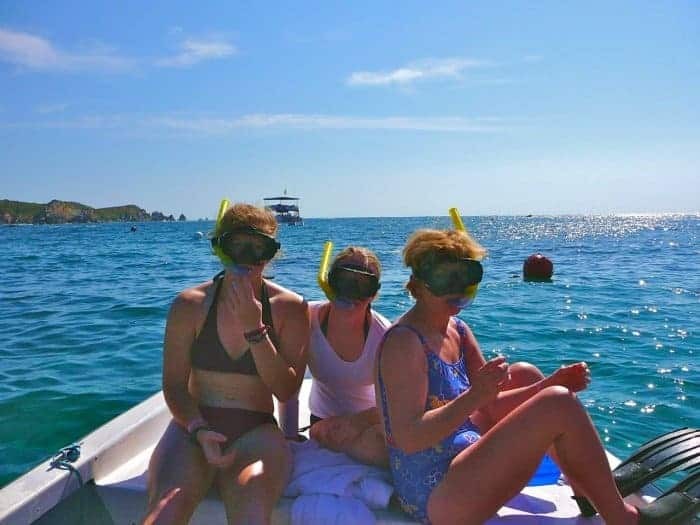 Read our complete Guide to Snorkeling in Huatulco for tips on the best beaches for snorkeling from shore and the best ( and safest) Huatulco snorkeling tours. The best way to experience a culture is to dive into its local cuisine. Chiles&Chocolate located in the pueblo of Zimitan on the outskirts of the Bahia de Huatulco’s hotel zone offers hands-on instruction on Oaxacan cuisine. 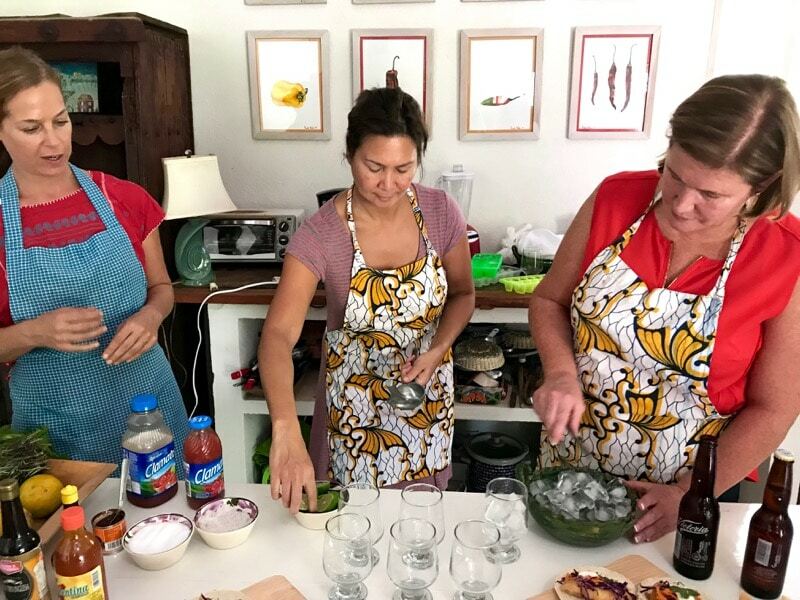 Learn about local indigenous Zapotec culture and how to use regional ingredients such as nopal, chapulines (toasted grasshoppers) and Pacific Coast shrimp to make street food, party fare and traditional main dishes. The reasonably-priced tuition includes pick up and drop off at Secrets Huatulco. 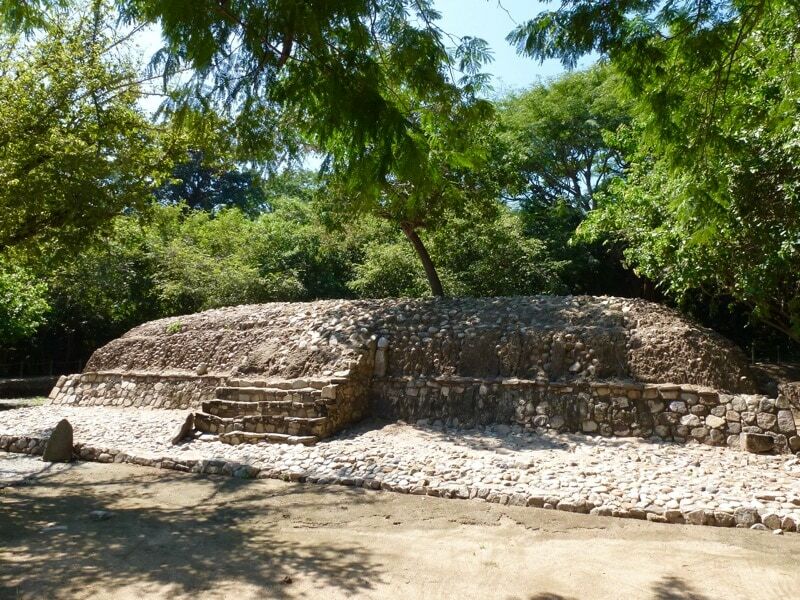 Explore history carved in stone at Rio Copalita archeological site, a recently excavated site featuring a small but top quality museum as well as a vast protected zone dotted with ruins of pyramids, a ball court and temples. The site was the ancient metropolis of Copalitan, occupied by the Zapotec and Mixtec people from 500 BC onward. Secrets Huatulco is a five minute taxi ride to this site so it’s possible to visit independently. 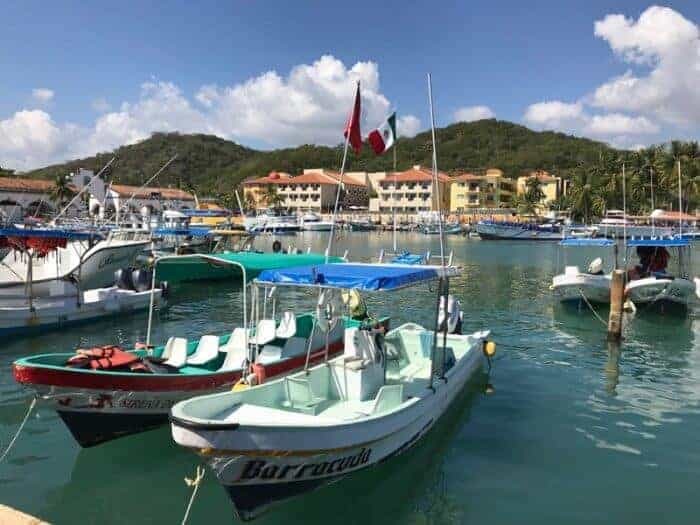 One of the top things to do in Huatulco whether you’re on a cruise ship excursion or staying at a resort, is to visit La Crucecita, the economic hub and cultural heart of Huatulco. The town of La Crucecita is just a 10-minute taxi ride from Secrets Huatulco and the main attractions are within easy walking distance of the zocolo ( town square) so this excursion is easy to do independently, allowing you the most flexibility and saving you money. 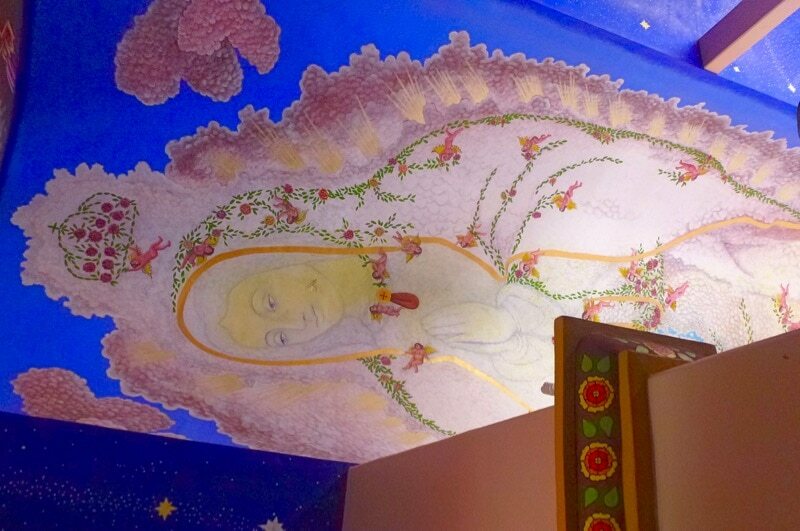 The top things to do in La Crucecita include shopping for Pluma Hidalgo coffee, sampling mezcal and browsing artisanal crafts as well as visiting the Catholic Church, home to Mexico’s largest mural of the Virgin of Guadalupe. If you’ve read my post 7 Reasons to Love Mazunte you’ll already know I’m a big fan of this small, eco-friendly town. Most tours from Huatulco combine a visit to the Mazunte Turtle Center (located on the site of a former turtle processing factory) with a boat tour of the mangroves of Ventanilla for some crocodile viewing and a stop at Zipolite beach as well as a quick stop for purchasing the natural cosmetics made by the Mazunte Natural Cosmetics Factory, a local women’s cooperative. If you’re really interested in witnessing a sea turtle nesting or sea turtle release, you may be disappointed with the Mazunte Turtle Center which is more of a research and education facility. Its important to know that the sea turtle nesting period for olive ridley turtles takes place between July and November, so if you’re visiting in January or February it’s very unlikely you’ll see any sea turtle nestings. 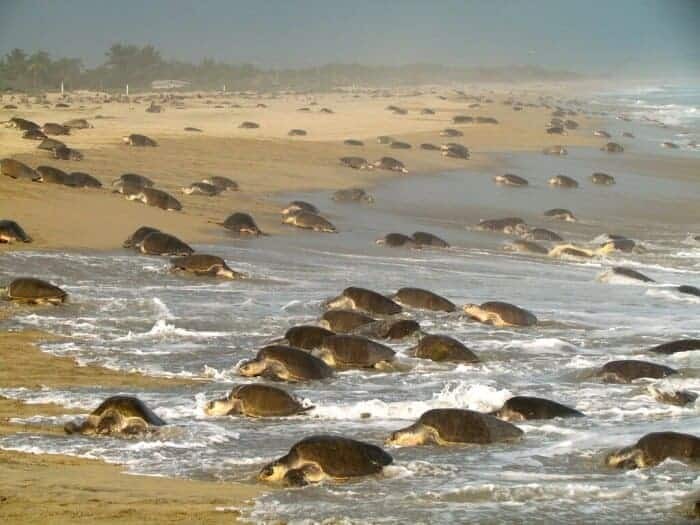 If you’re in Huatulco during the season the sea turtles lay their eggs, make a point to visit La Escobilla, one of the world’s most important nesting sites for olive ridley turtles. During an arribada, you can see up to 5,000 sea turtles nesting on this protected beach. Read our article on 8 Incredible Outdoor Adventures in Puerto Escondido for information on this incredible event. In fact there are so many sea turtles on this coast, I’ve actually seen nestings in front of hotels such as Secrets and Dreams. 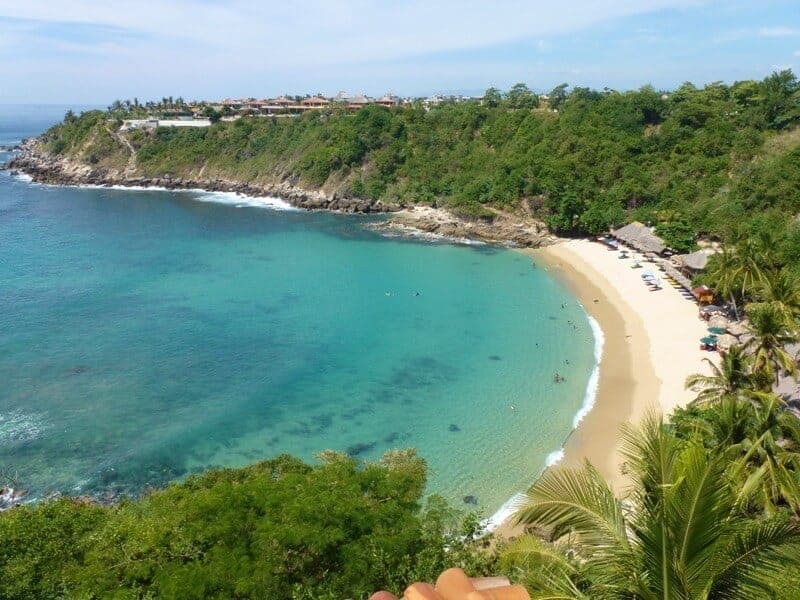 The city of Puerto Escondido with its diverse beaches and famous surfing scene is located 2.5 hours northwest up the Pacific coast from Huatulco and is well worth visiting for its string of beaches, rich cultural scene and eclectic bars and restaurants. It’s best to stay overnight to soak up its many charms but if you’re pressed for time, it’s possible get there and back on a day trip. Read our complete Guide to Puerto Escondido for details about the city then consult our transportation guide for details on getting to Puerto Escondido by bus. If you’d like to spend the night, you can’t go wrong with Hotel Santa Fe for its prime location on a quiet stretch of Zicatela Beach and superior service. Click here to check prices on the Hotel Santa Fe in Puerto Escondido on Hotelscombined.com, a search engine that compares room rates on hotel booking sites such as Expedia and Booking.com to find you the lowest rate. Disclosure: By providing handy links to affiliates such as Amazon and hotel booking sites, we may earn a small referral commission and you don’t pay anything extra. All opinions are 100% our own and we only link to products we think readers will enjoy. Read more on our Disclosure Page. Your post comes at the right time. I am deciding on Cancun or Puerto Vallarta. I didn’t know there’s Huatulco! Looks and sounds so luxurious and interesting, especially the turtles! Definitely check Huatulco out Carol! It’s much smaller than Puerto Vallarta but has lots to offer! I love the amount of detail you included in this. I also love Mexico and the Pacific coast but have never been to Huatulco. Chiles & chocolate is a perfect cooking combo so that tour sounds tempting, and it’s nice to see tortuga eco opportunities too. Saving this for our next trip! I haven’t been to Huatulco in many years and it looks like it’s grown a lot since then. I may have to go and check it out again!. Muchas gracias! I just saved this post to my Mexico Pinterest board. Now that our son has moved to Mexico City and we can now fly there non-stop of our home city, Philadelphia, I suspect we’ll be visiting our southern neighbor more often. On our last trip to Mexico, we visited Oaxaca City and some of the surrounding countryside. However, we never made it to the Pacific coast and I keep reading about the Huatulco area. Thanks to you, I now have information to consult when we’re ready to make that trip. Thank you for this wonderful post, Michele. Huatulco is a destination that has so far alluded me. But learning all about Secrets really makes me want to explore further. Although I’ve been to Mexico numerous times, I’ve never visited the state of Oaxaca. Secrets Huatulco Resort and Spa looks like a great place to explore the area of Huatulco and beyond. I love the photo of the resort at nightfall — very glamorous and romantic.